Each year the Rotary Club of Cirencester works in partnership with the Bingham Library Trust to identify a “Cirencester Young Citizen” whose contribution to the local community has deserved recognition. 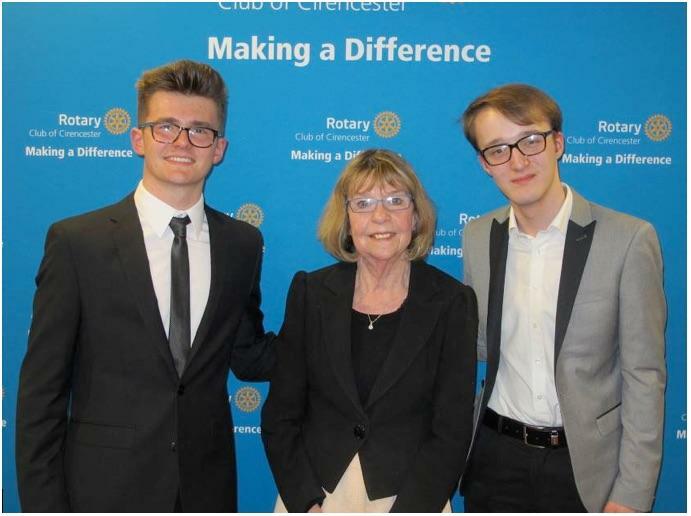 Each year the Rotary Club of Cirencester works in partnership with the Bingham Library Trust to identify a “Cirencester Young Citizen” whose contribution to the local community has deserved recognition. Uniquely, in 2016/17, there were two excellent candidates who the judges just could not separate and so two awards were made. Both winners were from Cirencester College and were aged 18 at the time of their nomination. Anthony Merle completed a fantastic social action project at the College, then returned as a graduate volunteer and was subsequently hired as a team leader, despite his young age. In this role, he delivered an outstanding project at the Abbeyfield Care Home in Cirencester, where he was very highly regarded. Ethan Moss was elected by his peers as Student Union President – and was reported by staff as the most conscientious post-holder ever. He also participated in the college radio station, their music festival and was an active college ambassador. Additionally, he also volunteered at the Cirencester Salvation Army charity shop and worked at Hospital Radio. Anthony and Ethan were accompanied at the award ceremony by their respective parents and by Libby Reed, Vice Principal of Cirencester College. The full citations were read by Rotary Vice President Shaun Gibson and awards handed over by Margaret Rickman, of the Bingham Library Trust.